This morning SEAT Sport delivered the hundredth SEAT Leon Cup Racer – destined for the Target Competition team – at their HQ in Abrera (Barcelona). Thus, in just fourteen months, this great quantity of cars have been sold and have showed an exceptional demand and level of response of the SEAT Leon Eurocup, as well as for the TCR International Series – with nine wins from fourteen races – and other contests like the CER (Spanish Endurance Championship). 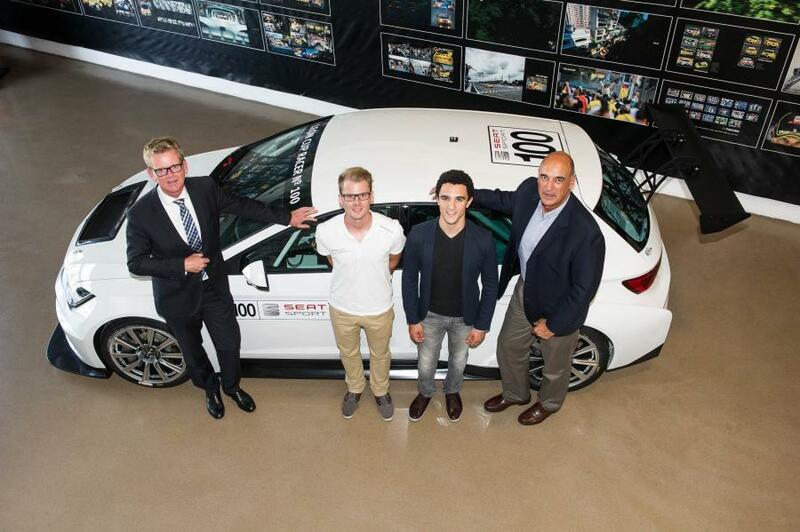 Dr. Matthias Rabe, SEAT Executive Vice-President for Research and Development and Jaime Puig, Director of SEAT Sport, marked the occasion with Markus Gummerer and Andreas Gummerer, representing team Target Competition by handing over the 100th SEAT Leon Cup Racer. The Austrian team will take on board the sixth unit and eleventh in total to enter three races of the 2015 SEAT Leon Eurocup – where they currently compete with five vehicles – in the hands of young Dutchman Loris Hezemans. They also take part in the TCR International Series with three more models. The commitment is another example of the growing belief in the SEAT Leon Cup Racer, a car designed from scratch by SEAT Sport. The Target Competition team will give the 100th SEAT Leon Cup Racer its debut next weekend on the 4th and 5th of July for the next round of the 2015 SEAT Leon Eurocup. 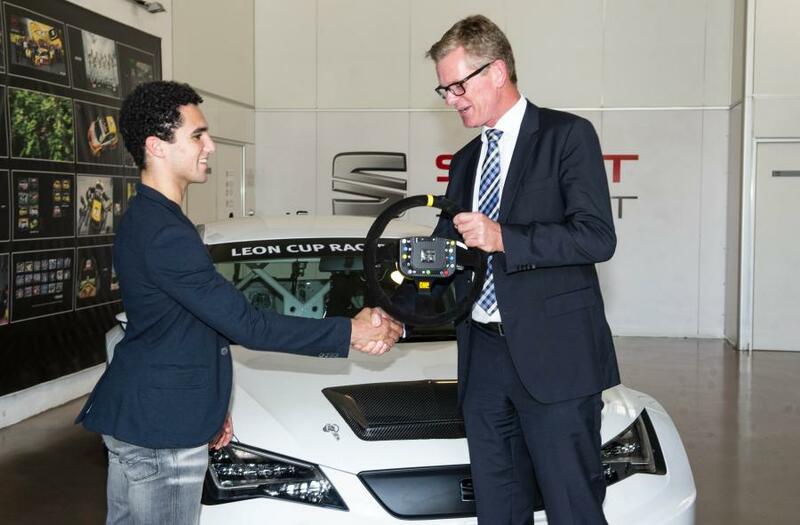 “The SEAT Leon Cup Racer keeps gaining followers and fans. This is because it is a very competitive car and it has shown and proved this in all the competitions it has entered. It boasts a turbocharged two litre engine, a potential output of 330CV and a six speed gearbox with a double clutch. It is a very light car with a low centre of gravity, which means it is a very quick vehicle and fun to drive. Also I have to say that we are really proud of how the SEAT Leon Cup Racer has been received in the world of motorsport and the work, day-in-day-out, that our engineers are doing at SEAT. It is a necessary link between the world of competition on the track and usability on the city streets: the SEAT Leon CUPRA,” commented Dr Matthias Rabe, SEAT Executive Vice-President for Research and Development. 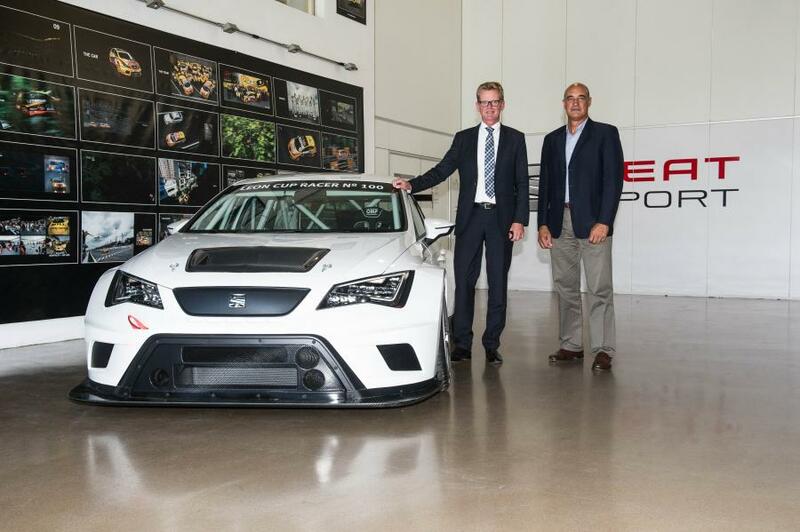 “We are really satisfied with the progress of the SEAT Leon Cup Racer. In fact the model we take today is the sixth we have used this season and the eleventh in total since April 2014 to compete in the SEAT Leon Eurocup and the TCR International Series. We are heavily involved in these competitions, and for us it is vital to be able to count on a car that we know will give us excellent performance. With the SEAT Leon Cup Racer we found what we were looking for: something capable, fast, reliable and fun,” explains Markus Gummerer, Principal of Target Competition. “The SEAT Leon Eurocup is pure emotion. Thanks to the appeal of the Cup Racer we can enjoy intense races in every one of the European circuits that we visit and where each round takes place. The result is the great fruit from the work of a highly prepared team of professionals totally committed to the project. 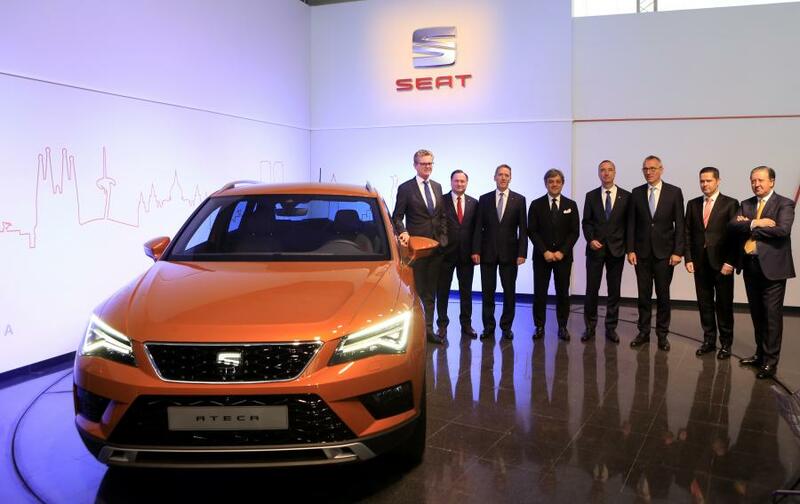 Delivery of the hundredth unit means that we are heading in a good direction,” outlines Jaime Puig, Director of SEAT Sport. SEATCupra.net had a chance to interview Jordi Gene about the CUP Racer and how similar it is to the Leon Cupra. Watch the exclusive video below. I am trying to obtain the full Seat Leon cup racer body kit for a show car in our showroom, is there any way that we can buy the full body kit and alloys. I feel that this will help us draw in more footfall with advertising and being the only Seat garage in the UK to have one would be a massive help. please reply to my e-mail if this is in anyway possible. Hi. 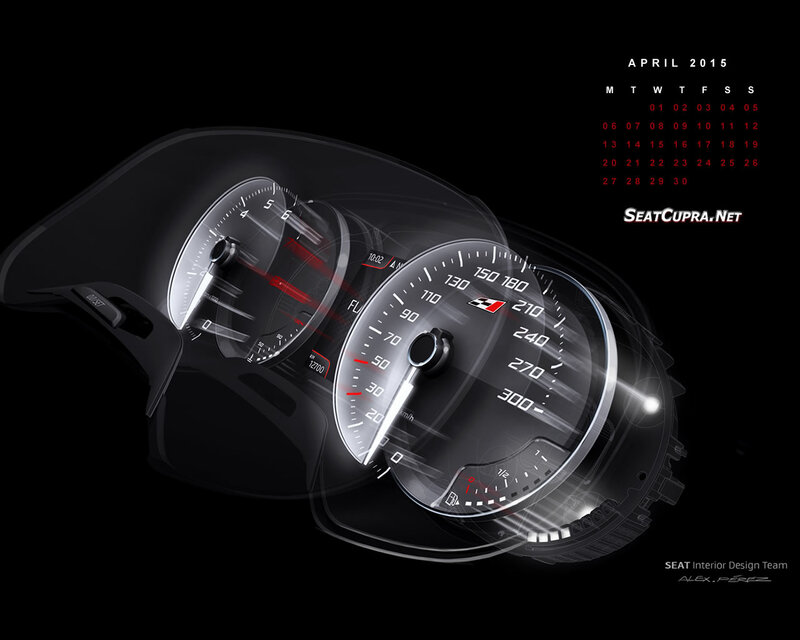 Have you tried contacting SEAT customer services / dealer support or SEAT sport?